In times where we enjoy being in the digital company of friends such as mobile phones, tablets, mobile applications and so on, our way of investing has also seen a rapid change. A decade ago, we used to rely on our stock brokers for their views and placed orders upon receiving a call from them, going by their judgment. But, now-a-days, with just a click of a button, we can access research reports, chat with the subject matter experts and come to a definite conclusion about investing in a particular script or not to build the portfolio. Same is the case while investing in mutual funds. We all know that mutual funds provide an investor a better opportunity to maximize the investments as compared to investing in direct equities. There are plenty of reports, web sites providing rankings of various mutual fund schemes which allow you to make an informed decision. However, there must have come a time when the schemes in which you have invested doesn’t generate profit for you. On the contrary, you see your wealth deteriorating over a period of time. So what’s the solution to this problem? Do we completely stop investing? No. Not at all. The solution is in The FundsIndia.com’s New India Portfolio. FundsIndia.com is one stop solution for all your personal finance needs. FundsIndia.com has come out with a portfolio which will help the investors to enjoy the benefit of four funds in one. With the government’s new set of reforms, the country’s economy is definitely going to grow on a fast track. So, FundsIndia.com decided to have a portfolio where investors can take the benefit of the desired growth and increase their wealth. With an improvement in India’s macro-economic numbers, it is prudent for an investor like you and me to invest in The India growth story. Moreover, if you are a small time investor looking to maximize your wealth by earning good returns, then The New India Portfolio should be your only choice. 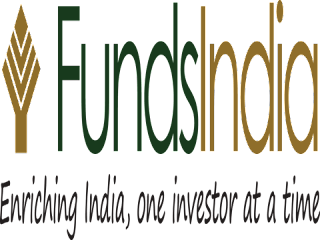 At FundsIndia.com, they understand that successful investing is a method and not a gamble and hence, they came up with The New India Portfolio portfolio by analyzing hundreds of schemes that are available in the market. 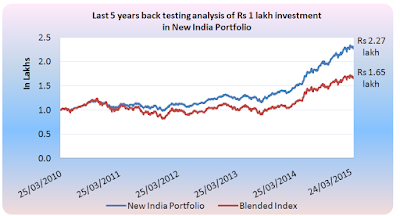 It is a 4-fund portfolio making the portfolio a diversified one in its own sense. By analyzing various plans, fundsindia.com built this portfolio which includes a diversified fund, a mid cap fund, a diversified themed fund and a long term debt fund. The performance of this 4-fund portfolio in the last five years through back testing analysis shared some interesting insights. With the PM’s Make in India campaign booming with lots of global investors pumping in money in our markets, it became all the more important to come up with a portfolio like such which will help in the growth of investments along with returns. So you must be thinking if this portfolio is for you? Predominantly yes, because we all love making money. Along with that, the portfolio is for one who is willing to invest for more than 5 years, which I feel every investor should do to earn substantial returns. It is suited for a high risk – high return type of profile, having 4 key funds working in the portfolio for you. So if you are worried for your investments and personal finance, fret not, FundsIndia.com has a solution for you in The New India Portfolio. Disclaimer: Mutual fund investments are subject to market risks. Please read the scheme information and other related documents carefully before investing. 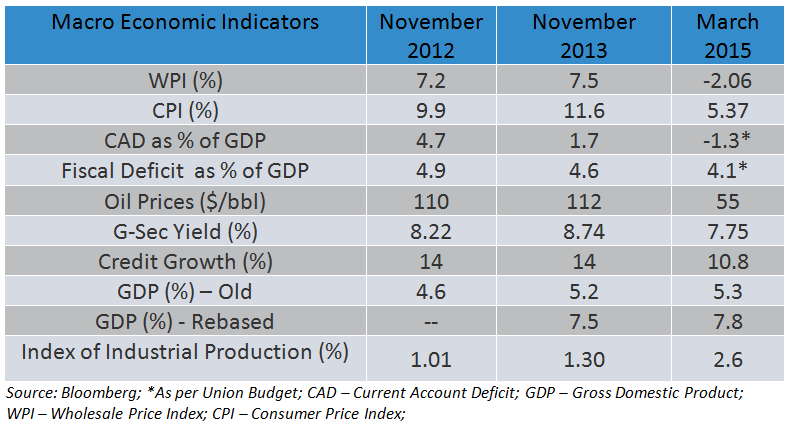 Past performance is not indicative of future returns. Please consider your specific investment requirements before choosing a fund, or designing a portfolio that suits your needs.